Separating this species from the very similar Laccaria laccata requires a microscope; both species are variable enough in their macrofeatures that the differences visible to the naked eye are not definitive. 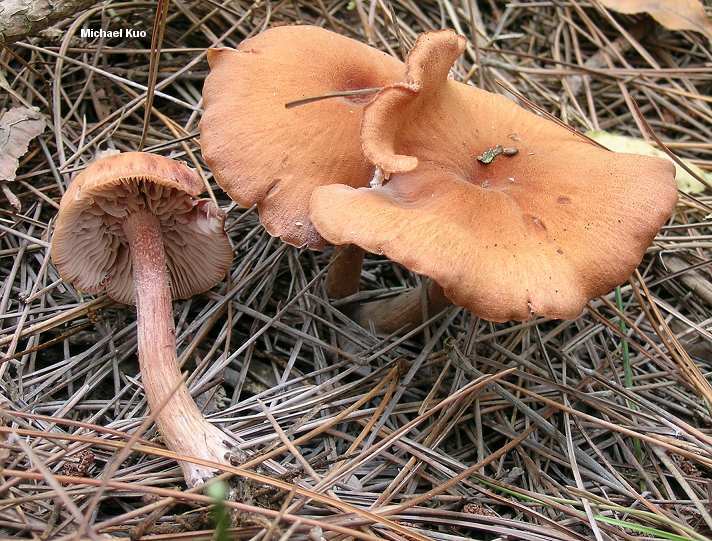 In general, Laccaria proxima is a slightly more robust species, has a somewhat darker cap with a rougher texture, and never has a lined cap margin. 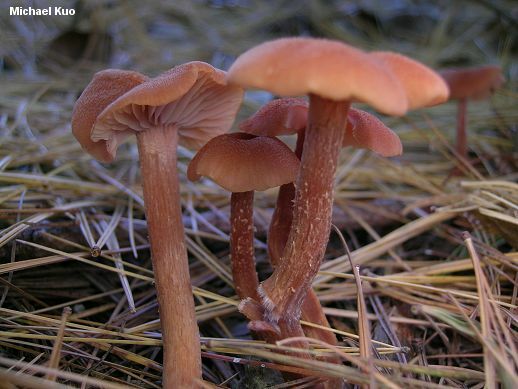 Laccaria laccata, however, can be more robust than it typically is, can be darker than it should be, and often sports a somewhat roughened cap with a non-lined margin. 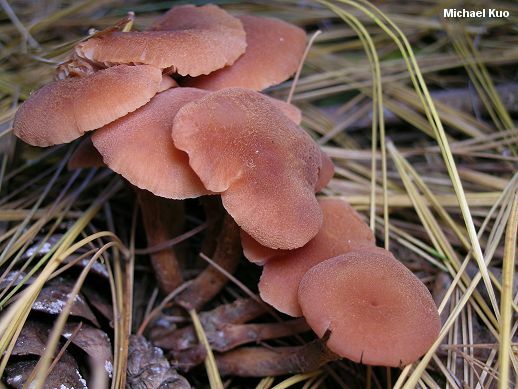 While Laccaria proxima grows only under pines, Laccaria laccata grows just about anywhere, including pine forests. So, if your mushrooms were not growing under pines, they are not Laccaria proxima . 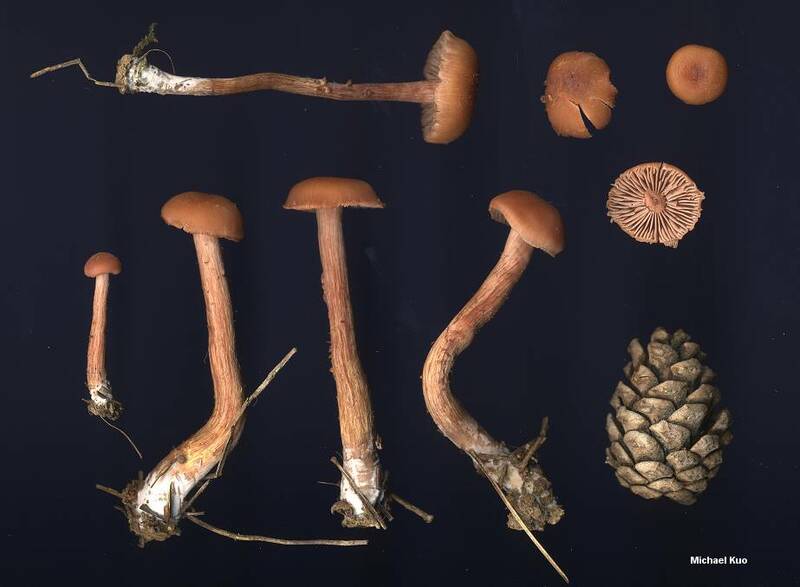 . . but if they were, you will need to consult microscopic features: the spores of Laccaria laccata are round (or nearly so), and have fairly prominent spines; the spores of Laccaria proxima are mostly elliptical in outline, and have smaller, less prominent spines. Ecology: Mycorrhizal with pines (Pinus species), especially in young plantations; growing scattered or gregariously; summer and fall; widely distributed in North America. Cap: 1.5-7 cm; convex, becoming flat and sometimes uplifted; the margin inrolled at first, later straight and not lined; at first finely roughened, later more prominently roughened or scaly; reddish brown to orange-brown. Stem: 2.5-8 cm long; up to 1 cm thick; equal or with an enlarged base; finely or prominently hairy and fibrous-shaggy; colored like the cap (sometimes with a darker base); with white basal mycelium. Flesh: Thin; colored like the cap or paler. 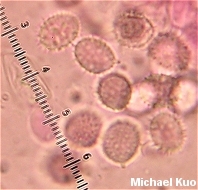 Microscopic Features: Spores 8-11 x 7-9 µ; elliptical; spines mostly 0.5-1 µ long. Basidia 4-spored. 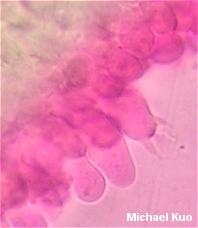 Cheilocystidia filamentous to subclavate or subcapitate; to about 70 x 10 µ. Pileipellis a cutis of elements 5-10 µ wide, with occasional or frequent bundles of upright elements; terminal cells subclavate to capitate. REFERENCES: (Boudier, 1881) Patouillard, 1887. (Saccardo, 1891; Mueller, 1987; Phillips, 1991/2005; Mueller, 1997.) Herb. Kuo 09280305, 11020903.